*Size: 2"" long (with hooks) and 3/5""wide. *Package Include: 1 pair of women's dangle earring. GREAT MATERIAL - These twist wave womens earrings are highest quality available. Light weight, high resistance to rust and Not allergic. Size: 2" long (with hooks) and 3/5" wide. UNIQUE DESIGN - Fashion and double linear loops design make you charmer and elegant, beautiful and attractive. The different pieces of the earrings are all on piece of soldered metal so you do not have to worry about them coming apart. IDEAL ACCESSORY - With their chic twist shape and beautiful shine, they will put the perfect finishing touch on a fashionable outfit. Suitable for going party, banquet or everyday wear. PERFECT GIFT - Come with a free gift box. The double linear earings will be a special gift for women or girls, you can wear it in any occasions, such as souvenir, party, valentine's day, birthday, anniversary, graduation, or a particular party, it makes you more attractive, charming, fashion and catch people's eyes. RISK FREE GUARANTEED - Customer satisfaction is our first priority. 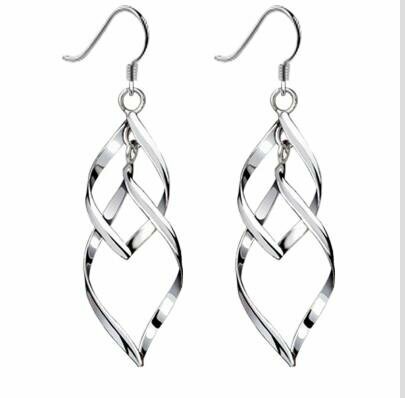 We guarantee you will love our drop earrings, that's why our product is backed with a 100% money back guarantee. If you are unsatisfied in any way with this product, we will refund your money, no questions asked.